Fundación Real Madrid, the social arm of Real Madrid CF — a professional football club dubbed to have the world’s most valuable sports team, is partnering with Philippine-based Roxas Foundation Inc. (RFI), the corporate foundation and the social development arm of Roxas Holdings Inc. (PSE: ROX), to train a select group of underprivileged Filipino children. In a statement, Roxas Foundation President Beatriz O. Roxas said the partnership embodies the vision of RFI and Fundación Real Madrid which is anchored on improving the lives of children through education. “There are 240 children, aged six to 12 years old, who will benefit from the partnership. The beneficiaries are from indigent families who belong to the poorest of the poor that we visited in the past months,” Roxas said. 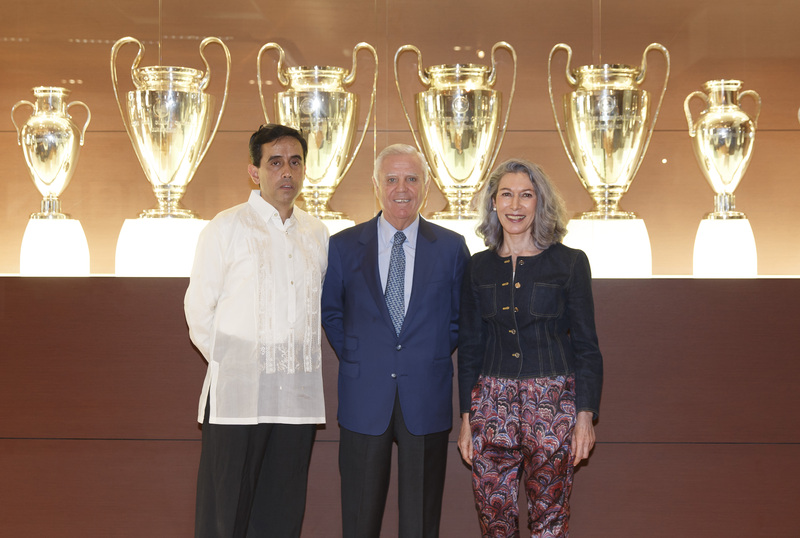 Standing at Real Madrid’s trophy room are, from left to right, Fundación Santiago Executive Director Chaco Molina, Fundación Real Madrid Vice President Enrique Sanchez, and RFI President Beatriz O. Roxas. She added that 180 of the beneficiaries come from Nasugbu, Batangas, where the Central Azucarera Don Pedro Inc. of RHI operates, and the 60 children from La Carlota, Negros Occidental where Central Azucarera de la Carlota, Inc. and Roxol Bioenergy Corp., both also under RHI, have operations. “These children have gone through a tedious process of selection conducted by RFI and the Department of Social Welfare and Development. They were selected based on the assessments we carried out and supported by the recommendation of their teachers,” Roxas said. 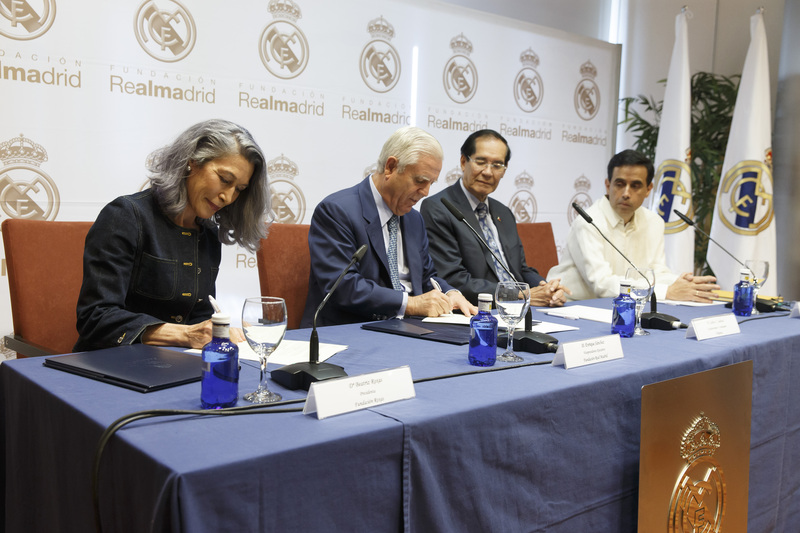 Signing the agreement are, from left to right, RFI President Beatriz O. Roxas and Fundación Real Madrid Vice President Enrique Sanchez. Looking on are Philippine Ambassador to Spain Carlos Salinas and Fundación Santiago Executive Director Chaco Molina. Last September, Fundación Real Madrid sent coach Miguel Angel Montoya to the Philippines to train 18 Filipino coaches who will conduct wholistic training sessions under the Social Sports Schools managed by RFI. “In line with Fundación Real Madrid’s theme of ‘they play, we teach’, the Saturday sessions with the children beneficiaries is geared toward instilling hope, moral values, a sense of dedication, and appreciation of health, nutrition and food, among these children to inspire them to work for a better life,” Roxas said. 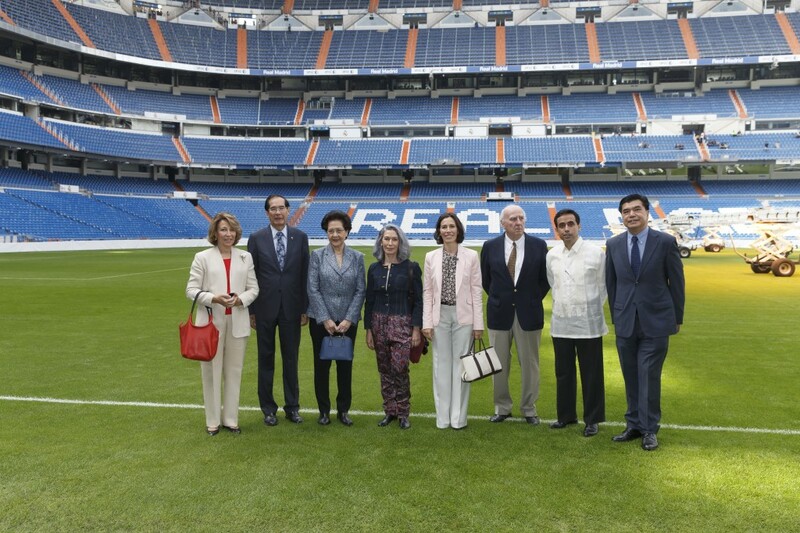 Standing at the Real Madrid grounds are, from left to right, Marta Roxas, Philippine Ambassador to Spain Carlos Salinas, Isabelita Salinas, RFI President Beatriz O. Roxas, Pilar Roxas, Juan Areilza, Fundación Santiago Executive Director Chaco Molina, and Philippine Consul General Emmanuel Fernandez. RFI’s local partners in the project include Fundacion Santiago, led by RHI Chairman Pedro E. Roxas, and MAPFRE, an insurer with Spanish origins and which provides Real Madrid uniforms and medical insurance to the children.